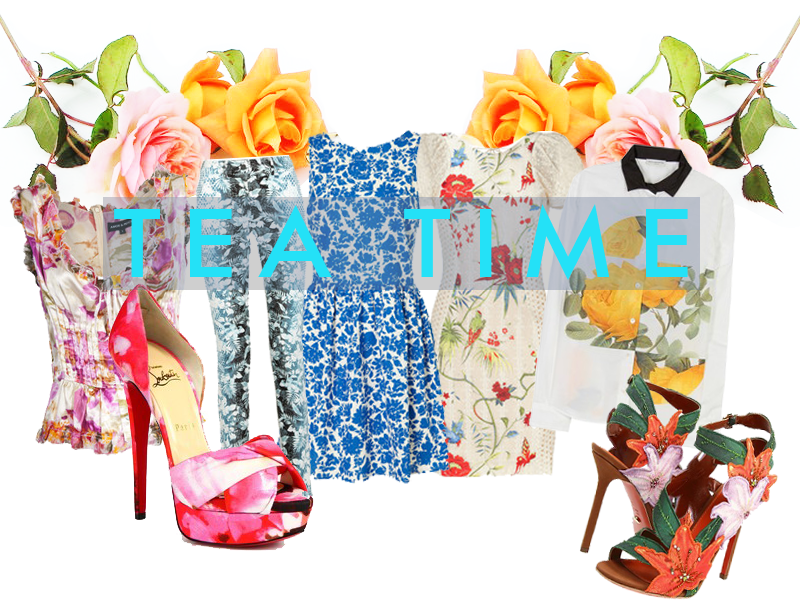 This Tuesday is all about my lust for a girly tea party set in a floral oasis. Just imagine the landscape; pixie pink rose petals and tanned orange marmalades scattered amongst blue dewy satins and slight mint linens. Oh, did I mention I'm talking about a wardrobe fresh for spring, strewn all over the guests of my next soiree? Now that I live on a golf course, I suppose I'll tell them that it's a "tee" party! Pictured: Amor&Psyche floral blossom silk short sleeve top, Alexander Wang printed high-rise skinny jeans, Topshop tall china floral print dress, Roberto Cavalli beige floral combo dress, Dries Van Noten cemre floral printed button-down shirt, Christian Louboutin floral print peep-toe platform pumps, Sergio Rossi A41550 heels.